In Japan today, August 15th, it was the anniversary of the end of World War 2. Because of the time difference, the anniversary in the US is August 14th. At work we all stood up and closed our eyes for a minute of silence in respect to all those that fought, served, were injured, and died in World War 2. 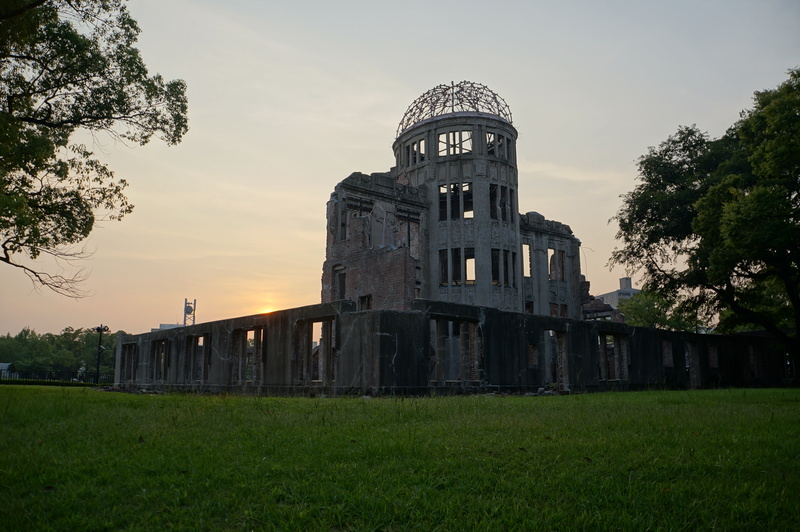 This is the Genbaku dome (A-bomb dome) a building that somewhat survived the blast in Hiroshima, because it was nearly directly under the hypocenter. It has since been preserved by the government, and serves as a monument for peace and global disarmament. Throughout its vicinity there are a lot of monuments recognizing a variety of different efforts and individual tragedies. Perhaps most interesting is the peace museum, which hosts a very large amount of information about the history and use of nuclear weapons—particularly in Hiroshima—and makes a strong case for global disarmament. There is quite a bit of soft racism in Japan, nothing to make you feel threatened or truly uncomfortable but I have never felt 100% at ease in public in Japan. I feel continually judged, and as my Japanese gets better I can now understand the snide and judgmental things people sometimes say about me. This past weekend alone I heard: “because of America I don’t like this place (in reference to all of the white people)”, “difficult white person”, “he smells bad”, “there’s an idiot here”, “there sure are a lot of foreigners here”, etc. These comments are nothing serious, but they are all ignorant in their own special way. Obviously not everyone says these things, just the people who feel it’s necessary to make a verbal comment. My point is: I was nervous about going to the Genbaku dome. As an American I expected a lot of judgment, even at worst a public shaming for my part as a citizen of the country that killed so many people with atomic warfare. These were paranoid misapprehensions. Although I did hear the normal amount of ignorant chatter, for the most part I felt a great feeling of peace and solidarity with the other visitors. This is saying a lot, because I don’t think I have ever really felt solidarity with the people of Japan. As kind and sociable as Japanese people are, my difference as a non-Japanese person has been strongly underlined during my time here. So, to feel reverence and a unity of purpose was surprising to me. Now, this was just a feeling of mine; I can’t say with any certainty what other people are thinking. Still, the entire memorial area is established in a very proactive and tasteful way. I didn’t get the sense that the purpose of the memorials was to blame anyone or to derive absorbent amounts of pity for the people lived through this tragedy (although they surely deserve our greatest sympathy and admiration). Instead there was just a lot of relatively unbiased information. For example, in the museum there were displays that discussed the events leading up to the war and the bombings and the atrocities committed by both sides. There was a display that discussed why The US decided to make and use the bomb, and how Hiroshima was a military strong point. None of these excuses the use of atomic weapons, but the museum served to provide a context. After establishing a context, the displays presented the effects and implications of atomic warfare. The ultimate purpose, it seemed, was to prove the very realistic need for nuclear disarmament, and to illustrate the extraordinary tragedies of war. If you can’t tell, I was very impressed by this museum on a practical level. I was also very emotionally moved by what I saw and learned. I think it’s important for US citizens to visit this place and learn about their position in the world. We have a responsibility to understand history from a variety of perspectives, not just our own.